I don’t know about you, but I can’t get enough of yummy baked goods this time of year — ‘tis the season for pumpkin everything! Besides eating all the pumpkin scones in sight, I’ve got big plans this month to take advantage of my favorites season, like visiting a pumpkin patch, adding some fall accents to our home decor, and adding a few cool-weather staples into my wardrobe. 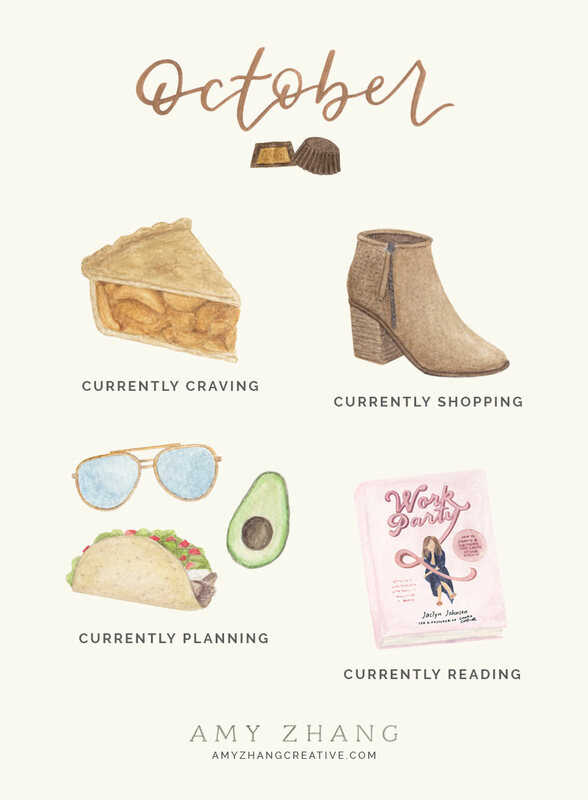 Read on to see what I’m loving for October — and be sure to sign up for the mailing list for more illustrated goodies! More warm and cozy hues! I think our October colors celebrate fall even more than last month’s — I especially love how much they remind of the colors we’re seeing with the leaves starting to change. Throw in a cloudy, stormy blue for some drama, and you’ve got a perfect fall palette! All the pie! I’m not a big dessert person in general (aside from my undying love for donuts), but I do love a good slice of apple pie this time year. I’m constantly on the hunt for the perfect recipe, so if you’ve got a good one, please feel free to send it my way! The perfect pair of ankle boots. I’m a creature of habit and pretty much live in my ankle boots year-round, which means I usually need to invest in a new pair by the time fall rolls around. I’m loving this pair from Target — the chunky heel and laser cut details are so cute! Have you read WorkParty yet? I’m officially obsessed with this book, which is by the founder of Create & Cultivate, Jaclyn Johnson. It’s filled with inspiration from successful boss ladies, practical advice for building a business, and empowering messages for women in the workplace. Our trip to San Diego! We’ll be there next weekend, so I’m officially in full research mode. Old Town San Diego, Balboa Park, and the San Diego Museum of Man are already on the list, but I’m still working on my list of the yummiest tacos, cutest coffee shops, and best local shops. We’ll be trying to fit some beach time in as well, of course!